While at Gastronomie.com site reading about the closing of La Ferme de Mon Père, I found this news about the Michelin Guide for the Benelux countries. The guide has been pulled from sales because of a problem with one of the reviews. Apparently a "bib gourmand" -normally awarded to restaurants with good quality/price rapport- was awarded to a restaurant which had not yet been opened at the time of the publication. 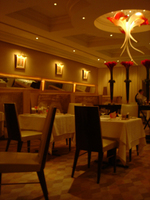 Ostend Queen restaurant owner Fernand David said he got into the guide because of the "good relations" he had with Michelin, and because he was sponsored by an established three-star chef. "We reached an agreement to appear in the 2005 edition of the Red Guide and to not have to wait a year unnecessarily" Full story in English is on the BBC. Tsk, tsk. Scandal, scandal, espeically coming in the wake of Pascal Rémy's book, L'inspecteur se met à table, exposing the dirty laundry inside the Michelin organization. This is not going to be pretty. This, and Anthony's in Leeds not getting the widely expected -and well deserved- star, a scandal indeed. La Ferme de Mon Père to close, and foodie survival kit! My friend Adrian in Paris in working over time giving me interesting news today. First of, Marc Veyrat is closing La Ferme de Mon Père in Megève. Happily, L'Auberge de l'Eridan in Annecy will remain open, as well as the new-ish restaurant at the Roland Garros tennis club where he oversees the menu. There is no news yet on his laboratoire reportedly to be open in Paris. "..to doctor up even the most repulsive meal on the go using this handy kit stocked with all the essential herbs and spices, plus indispenable extras like tabasco sauce and wasabi!" First of all, sorry I'm late in wrapping this up, there is this pesky thing called work that tends to get in the way of fun. And what fun it was too. Altogether forty very wacky wines indeed. I must say I wasn't entirely sure about the theme at first, as the earlier editions of Wine Blogging Wednesday have been a little -shall I say- noble and rather educational: inexpensive new world Merlot, Spanish Red, Australian Shiraz, and new world Riesling. And what did I come up with, wacky wine names! Classic. Oh well, at least we are going to have lots of fun, aren't we? Since I am the one hosting this edition of Wine Blogging Wednesday, which has –ahem- the ingenious theme of wacky wine names, I’ve been searching far and wide for wine with the oddest name. My search concluded with two pretty wackily named California wines, but as the tasting proved to be rather underwhelming, I decided to open another bottle –also with a pretty wacky name, though in another language- which I knew to be a lovely wine. There are so many dinners I’ve had in the last few months -a disappointing meal at L’Arpège, a great one at Pierre Gagnaire, and many many others- which, for different reasons, I simply haven’t got around to writing about yet. As I’ve said before, if I blogged about everything I did in real time, I would have no life at all, which would –in turn- make for a very boring blog for you to read. But once in a while, there’s a meal that simply begs to be written about immediately, even if it’s nearing midnight by the time I get home. The Campton Place dinner tonight is one. Why so, you asked? Well, because it is infuriating to see some place that was so very nearly there, with so much potential, stumbled on so many silly mistakes that could have easily been prevented. I went to dinner tonight truly hoping to love the place, after all, it is really suboptimal to have to drive to Yountville or Los Gatos every time I want a great meal. I’ve heard some very nice things about the chef at Campton Place, and have been looking forward to trying his food. I decided at about 5pm today that tonight would be it, called the restaurant, and was able to get a 7pm table, a little on the early side for me, but as I’ve just come home from a long skiing weekend, the time was perfect. My dining companion Dave and I arrived at the restaurant to find a very pleasant room that was much smaller than I’d expected, not more than 18-20 tables altogether. This was quite a good sign, I thought, as the small size of the dining room should make it easy for the kitchen to control the quality of the food. Together we decided to have the tasting menu to get a good turn around the chef’s repertoire on our first trip there. I am a novice still when it comes to cooking beans -being a very recent bean convert- and I am skiing this weekend, so instead of doing anything beany-fancy, I am doing a very simple bean dish that is a favorite of mine: flageolet beans to serve with a roasted leg of lamb. 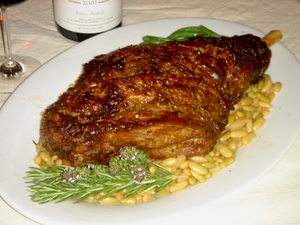 I wrote about the gigot d'agneau already, but not about the flageolet. These flageolets -in the prettiest shade of pale green- came from my friend Mr.Rancho Gordo, who sells his lovingly grown heirloom beans at the Ferry Plaza farmers market in San Francisco. The flageolets are very light tasting, and stay in shape beautifully even after cooking. They are the best accompaniment for a leg of lamb roasted with a mustard/garlic/rosemary rub because they absorb the lamb-y and mustard-y flavors from the lamb wonderfully. I serve these delicious beans right under the leg of lamb so that the juice from the lamb add even more flavors to the beans. The food blog world is taking mainstream media by storm. Today the Sacramento Bee ran another piece about food blogs called Finger-clickin good, featuring Elise, of Elise's Simply Recipes, and my friend and fellow SF food blogger Alaina of A Full Belly. Content: Articulate and well-traveled San Franciscan tracks the food world from California to Thailand and France; The Accidental Hedonist recently named this site the best food blog for restaurant reviews. More honorable mentions go to Sam, Clotilde, Bruce, Adam, and Josh. Kudos to them all! 4. In the lap of luxury at the French Laundry. What more can I say about the French Laundry? It is great to have one of the best restaurants in the world practically in my own backyard (well I am speaking on a global scale here). The precise cooking, inventive –at times even whimsical- menu, perfectly inconspicuous service, and luxurious ingredients combine to create one of the best dining experiences anywhere in the world. I really should make it there more often. Going to Manresa is more like visiting old friends than going to a restaurant these days. I’ve become such good friends with everyone there that Manresa is always a delightful experience, but it is clearly the food that keeps drawing me back over and over again. 7. Strolling to my neighbourhood haunts: 1550 Hyde, La Boulange de Polk, Tanpopo, and Kiss Sushi. I am very lucky to have these lovely places within walking distance, anyone who lives in the city knows how big a pain it is to find a parking spot anywhere. I could stroll down toward Russian Hill at dinnertime to 1550 Hyde for a lovely meal with fresh local ingredients prepared lightly by skillful hands and a glass of lovely wine, or on a Sunday morning to La Boulange on Polk St. for a morning latte and some lovely cannelés. I also walk the other direction, toward Japantown, for a big, steaming bowl of Shoyu ramen with rows of pan fried Gyoza (Japanese dumplings) on the side, or, -best of all- to Kiss sushi for a sublime meal of sushi and anything else Naka-san decides to give me that day.